The Journey to Excellence Program (J2Ex) helps individuals, businesses and organisations, and project teams develop a new paradigm of excellence. It focuses on enhancing sustainability and competitiveness by improving personal and organisational excellence. Program developer Nina Mapili has been working with entrepreneurs and managers in businesses and organisations in southern Africa since 1998, primarily in association with SAFRI – the Southern Africa Initiative of German Business, and much of the program’s pragmatic, hands-on approach grows out that experience. There are many possible points for beginning the Journey. Any business or other organisation – or even one in the making – selects its starting point in accordance with its level of organisational maturity. An individual begins her or his personal Journey in the Take Charge of Your Life! workshop. No matter where one starts, the workshop output is an action plan or plans that will take the team or individual on the next steps of the Journey. The core Journey to Excellence Program workshops are divided into two contiguous and intertwined programs, Preparing to Excel and Assessing Excellence, that are flanked by supporting programs designed to help businesses and organisations address the areas for improvement identified in the core programs. Each workshop is customised for the group at hand when presented. The output of every workshop is an action plan(s) that will take the team or individual on the next steps of the Journey. Preparing to Excel workshops are dedicated to helping businesses, organisations, and also individuals, take the first steps on their Journey to Excellence. They help individuals and management teams develop, implement and improve their strategic framework. Indications of workshop duration sometimes vary, as each workshop is customised to meet participants’ needs. For individuals, young and old, interested in developing and strengthening a growth mindset. The TCYM curriculum has a number of different versions, applicable to a wide range of participants. For individuals wanting to lead an enterprising life: aspiring entrepreneurs, young people, new managers, etc. TCYPF gives people an introduction to responsibly managing their money. TCYB is for entrepreneurs and management teams that see the need to introduce more structure into the way they do business. The workshop is also appropriate for individuals who have detailed plans for starting a specific business. Multiple companies can participate at once. TCYO is similar to TCYB, but is for executives and management teams from NGOs, governments and other types of not-for-profit entities. Multiple organisations can participate at once. TCYP focuses on developing a robust strategic framework and shared understanding of goals and strategies for a project. It is appropriate for teams from NGOs, businesses, governments, and etc. who want to start important projects a solid foundation. Multiple teams can participate at once. TCYS focuses on developing a robust strategic framework and shared understanding of goals and strategies for schools. The workshop may be broken into multiple parts in coordination with the school year and to enable schools to implement new approaches and strategies with minimal disruption. For those with a strategic framework in place. The first review for those who began with TCYB. The workshop can be used to prepare teams for Strategic Planning and/or Self-Assessment (at either level). This is not a Strategic Planning workshop, but can lead directly into one. This is a single company workshop. The Strategic Planning workshop can either follow on a Strategic Alignment workshop, or incorporate its core content in within the larger strategic planning framework. The workshop is customized for each customer. In line with the overall philosophy of the Journey to Excellence program, we facilitate management teams in conducting their own strategic planning process. We do not do it for them. This is a single company workshop. The Journey to Excellence engages participants in a process that initiates a robust cycle of continuous improvement – if followed over time. As with any other journey, though, travelers want to know periodically how far they have progressed. The three levels of the Assessing Excellence program provide them with the means to measure their progress—always at a level of rigour appropriate to the organisation’s level of maturity. All assessments are done by the managers/entrepreneurs themselves, using the EFQM Excellence Model, a globally respected management tool. It enables them to very objectively and holistically assess their company’s performance excellence relative to good and best practices, determine strengths and areas for improvement, and identify key improvement opportunities. Their assessment results guide the planning and implementation of improvement activities, and initiate the first cycle of continuous improvement. For those with a strategic framework in place, who now want to grow, improve, and introduce cycles of continuous improvement to their business. For example: those who have consolidated the results of TCYB or Strategic Alignment and now aspire to reaching the next level, or simply for the entrepreneurially curious (who may then continue as is appropriate). Multiple organisations can participate at once. For organisations with well-established strategic frameworks that are ready to challenge the status quo. Participants will ideally have completed the Strategic Alignment workshop and implemented resulting improvements. Multiple organisations can participate at once. For businesses and other organisations seriously aspiring to becoming world class. Participants must have at least a moderate level of organisational maturity and sustainability and a well-entrenched dedication to excellence. Multiple organisations can participate at once. Duration: mentoring generally takes place in a yearly cycle. Multiple cycles may be needed to sustainably anchor new mindsets—not only in team members, but in entire organisations. The J2Ex Program has a mentor development program and certifies successful participants. The Journey introduces a regular cycle of continuous improvement designed to increase a company’s level of organisational excellence step by step. Optimally, in the early years, a mentor helps teams to stay the course, but at later stages a facilitator may only be wanted – or needed – to lead workshops, if at all. Below you can follow the theoretical development of a new business on a Journey to Excellence – from inception to relative maturity – step by step. Remember, an established business or organisation can begin the Journey where ever appropriate. Take Charge of Your Project! workshops are not mentioned here; they may be used whenever an organisation has a project it wants to put on a solid strategic footing. Take Charge of Your Life! workshop. S/he learns how to turn dreams into visions, and draws up an Action Plan for launching the business of her/his dreams. Take Charge of Your Business! workshop in order to further develop her/his initial plans and put together a solid strategic framework for the business. This can also happen at a somewhat later stage if necessary. 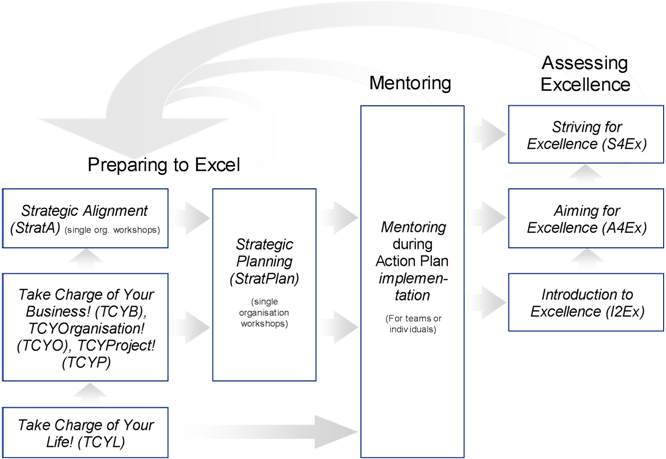 Mentoring supports Entrepreneur (and team) during the implementation of Action Plans. Strategic Planning workshop. Note: StratA and StratPlan are a single company workshops. Alternatively, as an only intervention, they attend an Aiming for Excellence workshop. Elements of StratA are incorporated, in much less depth, in A4Ex. This is the lower price alternative that may be sufficient for many small companies. Mentoring supports the Entrepreneur (and team) during the implementation of Action Plans. Strategic Planning workshop. In addition to providing clear strategies, the three will result in very focused Improvement Activity Charters and Action Plans – to be implemented in the coming months. Mentoring supports the management team during the implementation of Action Plans. By year 4, the company has a solid strategic framework in place and the management team has reached a level of maturity that make it possible for them to successfully implement Action Plans without the support of intense mentoring. Strategic Alignment. This may be internally facilitated if the company has invested in building up this talent in house. Strategic Planning workshop, followed by independent implementation of Action Plans. This may be internally facilitated if the company has invested in building up this talent in house. the company has a solid strategic framework in place and is ready to “up the ante” as far as excellence is concerned: it moves up to a more rigorous level of Self-Assessment. The company is very well set up and is ready to measure itself with the best. Its benchmarks are global. An annual (or other regular) cycle of review is in place and continuous improvement is a way of life. The team may maintain loose contact with a mentor. * The rights to the name Journey to Excellence and all workshops and other activities associated with it belong to Mapili GmbH.